viaLibri ~ Opera Omnia, Septem Tomis, Distincta, Postremum aucta & recognita. [with:] . . . . . . De Recta Pronunciatione Latinae Linguae Dialogus. Editio ultima. Opera Omnia, Septem Tomis, Distincta, Postremum aucta & recognita. [with:] . . . . . . De Recta Pronunciatione Latinae Linguae Dialogus. Editio ultima. Antverpiae,: Officiana Plantiniana, Apud Viduam & Filios Ioannis Moreti. 1614, 1613, 1611, 1609., 1614. Four parts in one. 4to. [viii], [xvi], 337, , [viii], 645, , 66,  pp. Two beautifully engraved portraits of the author: 1 mounted (taken from another source): portrait aged forty, half-length directed to left, holding a book and petting the head of a dog in lower left, wearing fur-trimmed coat. "1587", signed H.G. [Hendrik Goltzius] (mounted on verso of 2nd title), and a full-page engraving by Theodorus Galleus with two allegorical figures "Gloria" and "Fama" on upper margin, flanked by Virtus and Doctrina, with Modesta at the base (center), above portrait: "MORIBUS ANTIQUIS", oval border surrounding portrait with the name "JUSTUS LIPSIUS" [another portrait at the Clark Art Institute Museum Collections has similar elements but differs], four title pages with printer's device, decorative head and tailpieces; edges browning first and last few leafs, some marginal water staining, some brown spots on pp. 138-9, few small marginal tears (second leaf of last index near p. 645), corner of first title torn away (no textual loss). 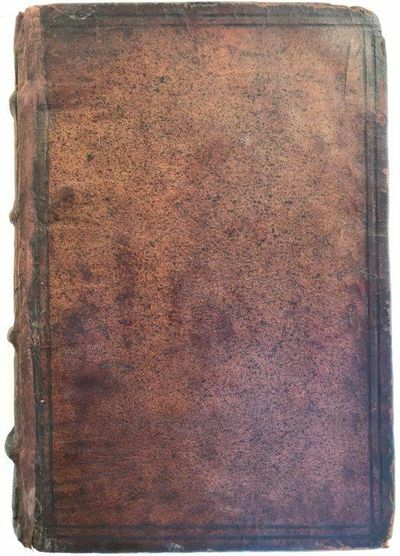 Original double ruled calf with four raised spine bands, all edges red with a small "J" inked on fore-edge; heavily worn with joints split, upper cover off. Blind stamps of prior ownership on title and elsewhere. Internally good, binding poor. JUSTUS LIPSIUS: WORKS, LETTERS, PHILOSOPHICAL AND POLITICAL - WITH ADDED PORTRAIT OF LIPSIUS BY HENDRIK GOLTZIUS. Lipsius' Sapientiae et Litterarum Antistitis fama postuma (first issued: Antwerp: 1607), "a collection of poems, eulogies, and polemical writings praising or defending Lipsius, gathered shortly after his death on the initiative of Balthasar Moretus with the help of Lipsius' former students Johannes Woverius, Hubertus Audeiantius, and Philip Rubens ..." Helene Cazes, Bonaventura Vulcanius, Works and Networks: Bruges 1538 . . . (2010), p. 333. For Hendrik Goltzius portrait of Lipsius: New Hollstein 1996, no. 234. See also: Adam von Bartsch, Le peintre graveur. Par Adam Bartsch ...: Dutch and Flemish engravers, 1876, v. III, p. 66. FULL TITLE: Opera Omnia, Septem Tomis, Distincta, Postremum aucta & recognita. [with:] . . . Sapientiae et Litterarum Antistitis Fama Postuma. Editio secunda, varie aucta & correcta. [with:] . . . Opera Omnia Quae Ad Criticam Proprie Spectant: Postremum ab ipso aucta, correcta, digesta. [with:] . . . De Recta Pronunciatione Latinae Linguae Dialogus. Editio ultima.